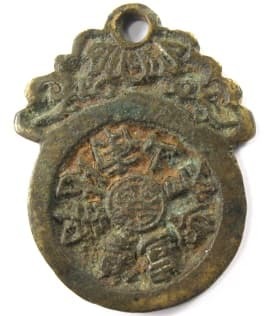 Beginning at least as early as the Han Dynasty (206 BC - 230 AD), the Chinese started to wear charms as pendants around their necks, to hang from their waists, or to attach to rafters of houses, temples, pagodas or other important structures. Some scholars believe that Chinese open work charms were among the first to be used for dress ornamentation and decoration purposes. Over the centuries, Chinese charms for various purposes and of different shapes gradually developed. Some were meant to be part of daily wear. Others were worn only on special holidays or for important rituals. Some of these more specialized types of charms, all with loop or eyelets and meant to be worn as opposed to carried, are discussed in detail in their own sections. For example, fish charms were worn by children and adults to help protect and inspire them as they faced various life crises. 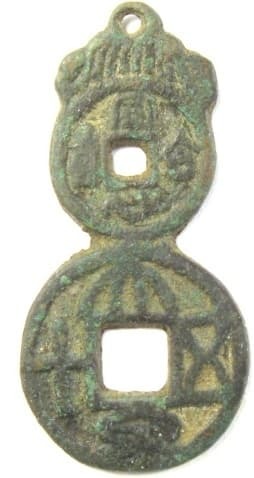 Lock charms were worn by children for protection as well as to promote good luck, wealth, rank and longevity. Peach charms were also worn to promote longevity as were gourd charms. Spade charms were meant to imitate an ancient form of shovel money. The following are Chinese charms of a different type but which also have loops for wearing as pendants on necklaces or hung from the waist. 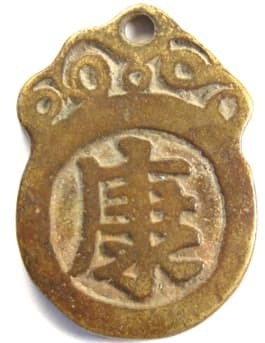 While it is not known when the first true charm appeared in China, most scholars agree that a fairly large number had appeared by the time of the Han Dynasty (206 BC - 220 AD). Some of these earliest charms were based on the coins of the time. Others were meant to be worn. 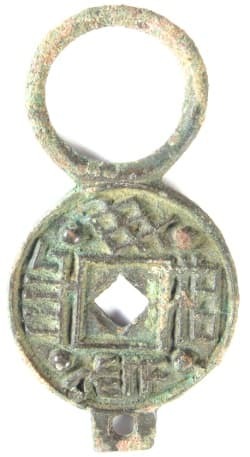 This charm is considered by many scholars to be among the first true charms of the Han Dynasty. There is a large loop at one end and a small tab with a hole at the other. It is uncertain how this charm was worn, though. It may have been worn as a necklace or hung from the waist. Some believe, on the other hand, that it may have been used as a button or fastener on a garment. The inscription (far left) is read clockwise. beginning with the character to the left of the hole, as ri ru qian jin (日入千金). The meaning is "may you earn a 1,000 gold everyday". 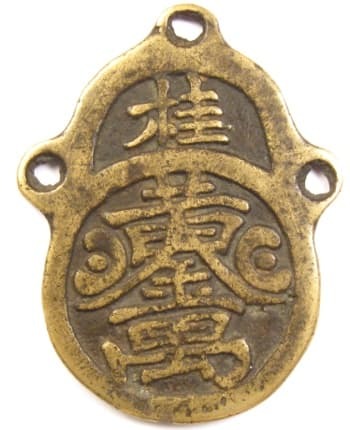 The inscription (near left) on the other side of the charm is read in the same manner as chang wu xiang wang (长毋相忘). The meaning is "do not forget your friends". The charm therefore expresses the wish that you "do not forget your friends when you earn much gold everyday". The large "dots" between the characters are believed to represent "stars". The significance of "stars" is discussed in detail at Charm Symbols: Star, Moon, Cloud and Dragon. There is another version of this charm with different inscriptions. One side has the Chinese chu xiong qu yang (除凶去央) which means "do away with evil and dispel calamity". The other side has the inscription bi bing mo dang (辟兵莫当) which translates as "avoid hostilities and ward off sickness". 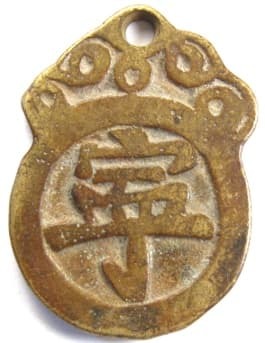 This is an example of an old Chinese charm which shows quite a bit of wear. 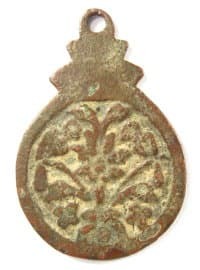 It has a loop at the top and was probably worn as a pendant on a necklace or perhaps hung from the waist. Unlike most Chinese charms, there is no central hole. The inscription is read top to bottom and right to left as chang ming fu gui (长命富贵) which is one of the most popular charm inscriptions. The translation is "longevity, wealth and honor". The fu (富) character for "wealth" is missing its top vertical stroke which implies that the wealth is "unlimited". If you look carefully, you will also see two birds, probably magpies, sitting on the tips of the tree branches at approximately the 10 o'clock and 2 o'clock positions. Magpies symbolize happiness because the first character in the word for magpie (xi que 喜鹊) is xi (喜) which means happy. Since there are two magpies facing each other, they become the symbol for "double happiness" (shuang xi 喜喜). Also, a pair of magpies symbolize marriage. This is based on an ancient legend that two heavenly lovers, the Oxherd and the Weaver Girl (Weaving Maiden), are allowed to meet each other once a year on the seventh day of the seventh month (known as qixi 七夕, the Double Seven, or Sisters Festival) by crossing a celestial river on a bridge made of magpies. But, the symbolism goes even deeper. Just below the branches at about the 7 o'clock and 5 o'clock positions are two flowers which are different is size and style to the very large central flower. These flowers are probably plum blossoms so it is understood that the tree behind the large central flower is in fact a plum blossom tree. In Chinese, one can say "there is a happy bird (magpie) on the tip of the plum branch" as xi shang mei shao (喜上梅稍) which sounds exactly like saying xi shang mei shao (喜上眉稍) which means "happiness up to one's eyebrows". This is a Chinese expression meaning "very happy". 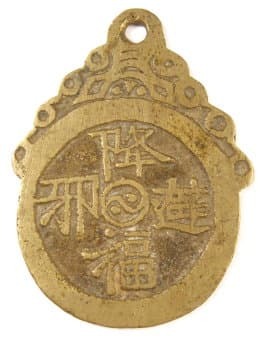 The reverse side of this old charm therefore expresses the desire for longevity, wealth, and happiness through the use of symbols. 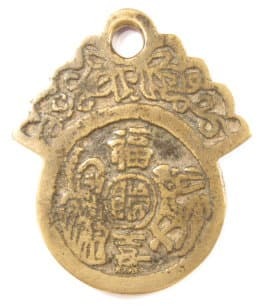 For more examples of symbols with hidden meanings on Chinese charms please see the meaning of charm symbols. This charm has a length of 40 mm and a width of 27 mm. The weight is 7.3 grams. 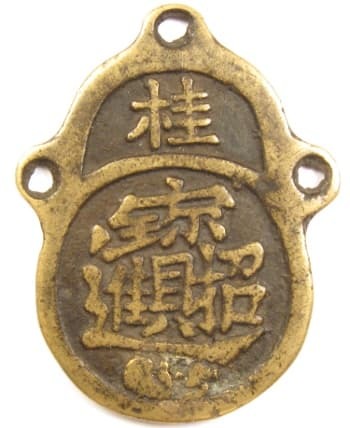 The inscription on this charm is read clockwise as wu zi deng ke, fu shou shuang quan (五子登科福寿双全) which translates as "may your five sons achieve great success in the imperial examinations" and "happiness and longevity both complete". In the very center of the charm is the character for happiness (fu 福) written in seal script. The reverse side also has written at the top the Chinese character fu (福) meaning good fortune or happiness. The character at the bottom is xi (喜) which also means happiness. The character in the center is shou (寿), meaning longevity, written in seal script. On the right is a deer. The Chinese believe that the deer lives to a very great age and, therefore, has become an emblem of long life. Also, the Chinese character for deer (鹿) and that for the salary a government official receives (禄) are both pronounced lu. The deer thus symbolizes the wish expressed on the obverse side to live a long life and to be successful in passing the examinations to become a government official. The figure to the left is Shou, the God of Longevity, who is always shown with a walking stick and is frequently accompanied by the deer. 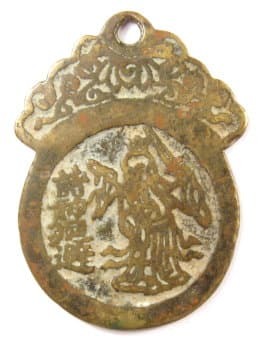 The God of Longevity, the shou longevity character in the center of the piece, the fu happiness character at the top, and the xi happiness character at the bottom all mimic the "happiness and longevity both complete" inscription on the obverse side of the charm. This charm is 56 mm in length and 47 mm at its maximum width. This charm with the nice patina has an eight character inscription expressing the desire for a long life accompanied by wealth, honor and position. Beginning at the nine o'clock position and reading clockwise, the first four characters translate as "Longevity as great as the South Mountain" (shou bi nan shan 寿 比南山). Continuing to read clockwise, the next four characters translate as "Longevity, wealth and honor" (chang ming fu gui 长 命富贵). In the very center of the charm, and inside the circle, is the Chinese character shou (寿) meaning "longevity". 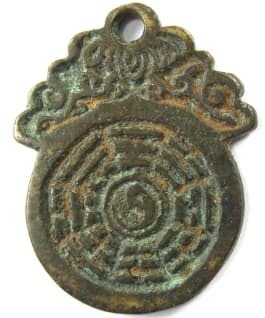 The reverse side of the charm displays the bagua (八 卦) or eight trigrams. At the very center of the charm is the taiji (太 极) or yin yang (阴 阳) known as the "supreme ultimate" symbol. For a more detailed discussion of the meaning and uses of the bagua, as well as to see other charms of this type, please visit The Book of Changes and Bagua Charms. This charm has a length of 51 mm, a maximum width of 40 mm, and weight of 32 grams. The "Five Blessings" were first mentioned in the ancient Chinese classic "Book of History" (shujing 书经 or shangshu 尚书) dating to the 6th century BC. The "Five Blessings", which are also known as the "Five Happinesses" and the "Five Good Fortunes", include longevity (shou 寿), wealth (fu 富), health and composure (kangning 康宁), virtue (xiu hao de 修好德), and the desire to die a natural death in old age (lao zhong ming 考 终命). The charm at the left represents "health and composure" with "health" (kang 康) on one side and "composure" (ning 宁) on the other. The "Five Happinesses" are frequently symbolized by five bats because the word for "bat" (fu 蝠) has the same pronunciation as the word for "happiness" (fu 福). Examples of this visual pun may be seen at Gourd Charms and Chinese House. This charm has a length of 34 mm, a width of 24 mm, and a weight of 11.2 grams. Traditional Chinese society emphasized the importance of having male children. One of the more popular folk charms depicted a boy riding a qilin (麒 麟) which is sometimes referred to in the West as the Chinese "unicorn". This scene is known as qi lin song zi (麒麟送 子) which translates as "the qilin (unicorn) delivers boys (or children)". In a certain sense, it is similar to the stork delivering children in the West. 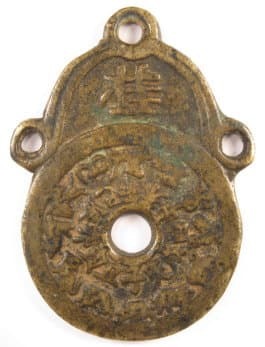 But, sons delivered by a qilin were considered to be destined to become high government officials so these charms were worn by women hoping that they would bear healthy male offspring. The wear shown on this particular charm demonstrates that it served this function over a long period of time. "Unicorn" is actually a misnomer because the mythical qilin actually had two horns, not one, as depicted here. The qilin was usually described as having the torso of a deer with fish scales, the bushy tail of an ox or bear, and hooves. The word for qilin (麒 麟) has the same pronunciation as the Chinese word meaning a man of 60 or 70 (qi 耆) so there is the implied meaning of a child living to a very old age. The boy is shown carrying a lotus in one hand. The word for lotus (lianhua 莲花) has the same pronunication as the word for "continuous" (lian 连). The implied wish is for the "continuous" birth of boy babies. There are other auspicious symbols. At the three o'clock position is a ruyi (如意) sceptre representing power and authority. At the five o'clock position is a "flaming pearl" signifying perfection and enlightenment. The six o'clock position has a silver ingot (sycee) representing wealth and at the seven o'clock position is a coral symbolizing longevity and and official government position. These auspicious symbols take on additional importance when we examine the other side of the charm. 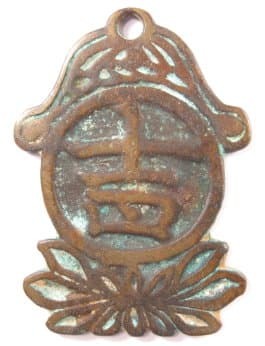 The reverse side of the charm shows a crane (he 鹤) standing on one leg. The wings are spread and the crane is looking back at the one o'clock position. A crane standing on a rock signifies a person being successful in attaining a high official position in the government. The crane is believed to live a very long time and is thus a symbol for longevity. There is another play on words here. "To stand alone" (duli 独立), such as the crane pictured here, has the same pronunciation as "individual effort" (duli 独力). The implied meaning is that a person can stand alone at the top by relying on his own diligence in his studies and in so doing be successful in passing the civil service examinations and becoming a government minister. The strange shaped rock that the crane stands on is known as a "longevity stone" because of its age. At the lower left are waves and foam representing the sea. The longevity rock juts out over the sea. This is yet another visual pun. The Chinese word for "standing alone before the tide" is duli chao (独 立潮). The word for "tide" (chao 潮) has the same pronunciation as the word for court or government (chao 朝). The hidden meaning is of a high government official "standing alone before the emperor". This charm has a length of 66.5 mm and a maximum width of 51 mm. 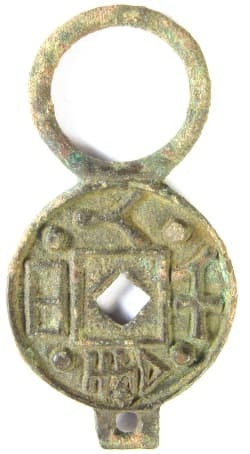 As is the case with the other charms displayed above, this charm has a single hole or loop at the top to allow it to be hung from the neck or waist. The charm has a very large ji (吉) Chinese character in the middle which means "lucky" or "auspicious". At the bottom of the charm is depicted a lotus. The lotus is one of the most prominent Chinese Buddhist symbols and stands for purity and enlightenment. The Chinese character for lotus is lian (莲). There is another Chinese character (连) which is also pronounced lian which means "in succession one after another". The hidden meaning of this charm is therefore that good luck should occur one after another or continuously. The reverse side of this charm is equally interesting. The single Chinese character in the middle is di (迪) which means enlighten. The lotus (lian 莲) at the bottom, which symbolizes enlightenment, again is associated with the other character (lian 莲) with the same pronunciation to give the meaning of enlightenment happening one after another or continuously. For other examples of pictures as symbols please see the hidden meaning of charm symbols. This charm has a length of 67 mm and a maximum width of 48 mm. 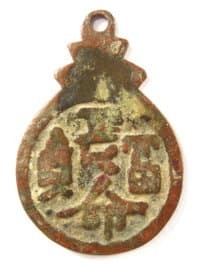 This pendant charm was meant to bring good luck to those participating in the imperial examination system to become government officials. Kuixing (魁 星), the God of Examinations and the Star of Literature, is shown holding a writing brush in his right hand and standing on one leg on the head of the mythical sea turtle ao (鳌). The ancient Chinese believed that the earth was supported by this very large turtle. The other side of this charm displays an ancient saying from a famous writer of the Song Dynasty. This charm is explained in more detail at Success in the Imperial Examination System. This pendant charm appears to be composed of two cash coins which are round with square holes in the middle. Chinese cash coins symbolize wealth and prosperity. The charm is shaped in this manner because it resembles a "gourd" which is another popular Chinese charm type with a number of auspicious associations. 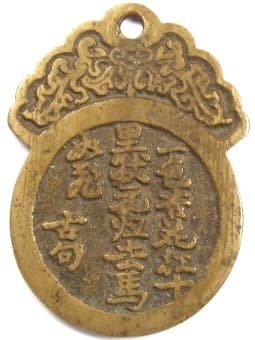 The inscription on the top "coin" reads tong xin he yi (同心合意) which means "to be of one mind". 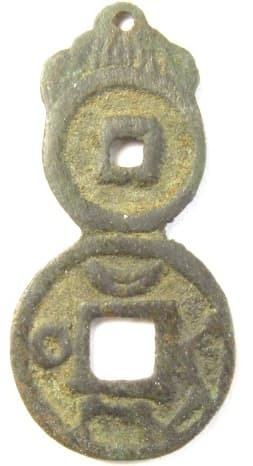 The inscription on the bottom "coin", which is identical to a famous coin from the Wang Mang era of the Xin Dynasty (7-23 AD), reads da quan wu shi (大 泉五十) and translates as "large coin 50". The symbols on the reverse side of the charm include a crescent moon above the square hole, the sun to the left, and the Big Dipper star constellation to the right and below the hole. This small charm is discussed in greater detail at Gourd Charms. Like the charm above, this one also has a canopy on top. However, it has three holes or loops instead of one. Also, the charm has a round circular hole in the middle. The large Chinese character at the top is gua (挂) which means "to hang". 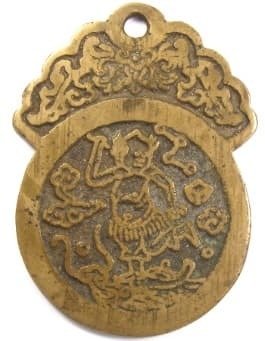 Since this looped charm was obviously made to be worn or hung on a wall, rafter, lantern, etc., I am unclear as to why this character is on the charm. 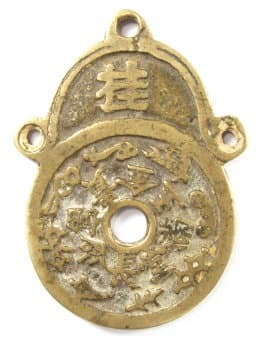 The inscription surrounding the round central hole is read clockwise as chang ming fu guai jin yu man tang (长命富贵金玉满堂) which translates as "longevity, wealth and honor", "let gold and jade fill your halls". Surrounding the outer rim are "eight treasures". Identifying the "eight treasures" on charms can sometimes be challenging because of their small size and similar shape. Starting at the one o'clock position and going clockwise is the flaming pearl, the yuan bao (sycee), the double lozenge, the coral, a single rhinoceros horn, the yin ding (silver ingot), the coin, and the sceptre (ruyi). To see other examples of "eight treasure" charms please visit The Eight Treasures. The reverse side also has the gua (挂) character on the canopy meaning "to hang". To the right of the round central hole is a deer. The Chinese character for deer (鹿) and the Chinese character for the salary of a government official (禄) are both pronounced lu. This is another example of using a picture as a symbol with a hidden meaning. The picture of the deer is expressing a wish for a top government office with a high salary, and a wish for longevity. There are other examples on this charm of using symbols with hidden meanings. Just below the deer's front hoof is an "upside down" bat. In Chinese, saying the words "an upside down bat" (fu dao 蝠倒) is pronounced exactly the same as saying the words "happiness has arrived" (fu dao 福到). Another symbol with a hidden meaning is the crab depicted between the tree and the center hole, at about the 9 o'clock position. The Chinese word for crab (蟹) and the Chinese word for harmony (协) are both pronounced xie. Displaying a crab is therefore expressing a wish for harmony. Located at the bottom of the charm and near the tree is the lingzhi (灵 芝) or "fungus of immortality". The deer is believed to be the only animal able to find this magical plant. Finally, the tree on the left is a pine tree which is an evergreen and therefore a strong symbol of longevity. The charm has a length of 68.6 mm and a maximum width of 50 mm. This old charm also has a canopy on top with the gua (挂) character meaning "to hang". One of its three eyelets, however, has broken off. There is a four character inscription encircling the central round hole which reads chang ming bai sui (长命百岁) which translates as "long life of 100 years". 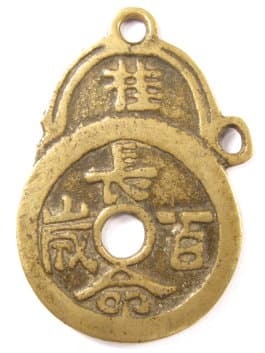 The reverse side of the charm also has the gua (挂) character "to hang". The four character inscription is fu gui chang jiu (富贵长久) which means "wealth and honor for a long time". The fu (富) character is missing its top vertical stroke which implies that wealth should be without limits. The length is 67 mm . Normally, the greatest width of a charm of this type is across the eyelets. Because one of the eyelets is missing, the greatest width is 44.5 mm across the round portion of the charm below the canopy. This is a very interesting pendant charm. 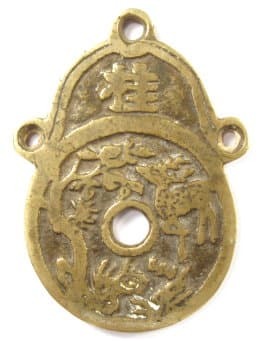 The upper part is similar to other pendant charms in that it has the character gua (挂), meaning "to hang", as well as the three holes or loops. However, the lower portion has what appears to be one very large and complex Chinese character. Actually, these are four Chinese characters that have been combined into one. The Chinese refer to this as lian zi gua pai (连字挂牌) which means a pendant with characters linked or combined. The four Chinese characters are zhao cai jin bao (招財進寶) which roughly translates as "money and treasures will be plentiful" or "attracts wealth and treasure". The zhao (招), meaning "attract", is at the lower right. 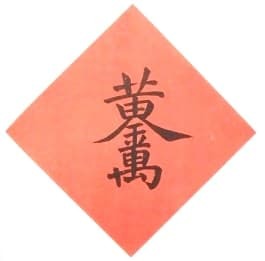 The cai (財), meaning "wealth" or "money", is just to the left of the zhao (招), and the left part of the zhao (招) becomes the right part of the cai (財) character. The jin (進) is at the far left with its very bottom stroke extending all the way across and holding all the characters together. But where is the bao (寶), the last character in the inscription? The upper part of the bao (寶) character, meaning "treasure", is written just above the zhao, cai and jin characters. The bottom part (貝) of the bao (寶) is the left part (貝) of the cai character (財) in the very middle of the charm. 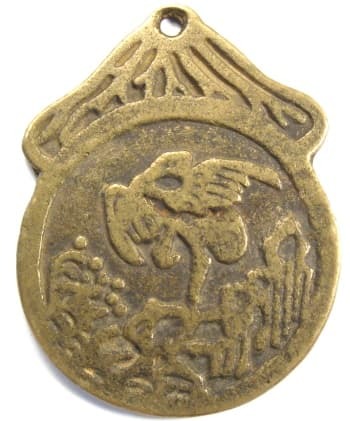 While it is a little unclear because of wear, a yuanbao (元宝) is pictured at the very bottom of the charm. A yuanbao was a boat-shaped or shoe-shaped ingot (sycee 细 丝) made of gold or silver and weighing 1 to 100 ounces. Yuan bao were used as a form of money in ancient China. The yuanbao or sycee thus symbolizes "wealth". This is the other side of the charm. At the very top is the Chinese character gua (挂) meaning "to hang". The larger complex character occupying the main body of the charm is another example of linked Chinese characters or lian zi gua pai (连字挂牌). In this case, there are three Chinese characters stacked on top of each other. The character at the top is huang (黄) which means "yellow". 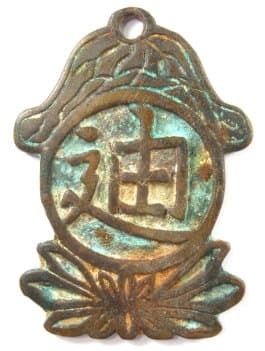 The character just below it is jin (金) meaning "gold" or "precious". You will notice that the bottom "legs" of the huang (黄) character form the top of the jin (金) character. Together the two characters (huang jin 黄金) mean "yellow gold" or, simply, "gold". The Chinese character at the bottom is wan (萬) which means "ten thousand". 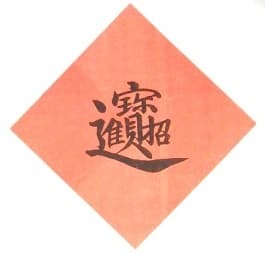 The bottom part of the jin (金) character forms the top part of the wan (萬) character. To completely understand the implied meaning of the inscription, however, one must also notice that located to the right and left of the huang (黄) character are two crescent-shaped objects. These symbols depict gold ingots (yuanbao) representing "wealth". It is the same symbol that is located at the bottom of the other side of the charm. In Chinese, one says "two" as liang (两). So the charm displays "two" yuan bao (gold ingots). But the same character liang (两) can mean a Chinese "ounce", also known as a tael. The tael was used as the measure of weight for the gold yuan bao and silver sycee. Therefore, the entire inscription is read as huang jin wan liang (黄金万两) which translates as "ten thousand tael of gold". This charm has a length of 54 mm and a maximum width of 42 mm. The weight is 23.8 grams. 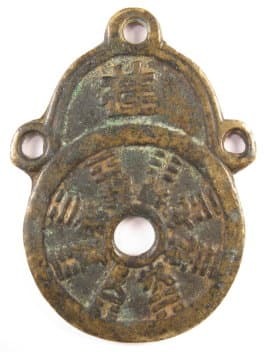 There is an interesting connection between this ancient bronze charm and Chinese woodblock prints. The Chinese have a long tradition of hanging colorful woodblock prints on the walls and doors of their homes particularly during the Chinese New Year (Spring Festival) and other holidays. These Chinese popular prints include many themes and are generally known as nianhua (年画) or New Year (Spring Festival) pictures. One type displays an auspicious inscription on a diamond-shaped red paper such as the example at the left. 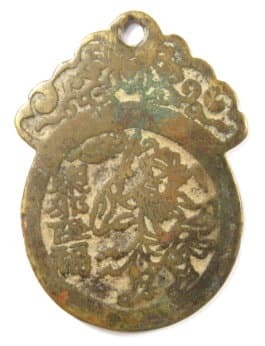 You will notice that the inscription is zhao cai jin bao (招财进宝), the same as that on the bronze charm above, and that it is written in exactly the same linked character style (lian zi gua pai 连字挂牌). This is another blockprint illustration. 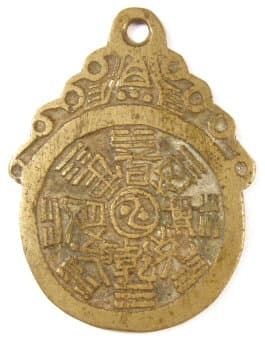 The inscription is huang jin wan (黄金万) and it is also written in the same style as the inscription on the other side of the bronze charm described above. 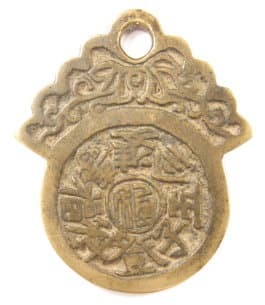 While this paper print lacks the two yuan bao (gold ingot) symbols portrayed on the bronze charm, the meaning clearly expresses the wish for much weath. These two auspicious prints were very popular in ancient China and it is said that they could be found hanging in almost every home up to the end of the Qing (Ch'ing) Dynasty. The technique of linking or joining Chinese characters into new and mystical symbolic forms reached an even greater extreme under the Daoists (Taoists) in the creation of Daoist magic writing (fuwen 符文). Examples of amulets with Daoist magic writing can be seen at Daoist (Taoist) Charms. This is another charm with the gua (挂) character meaning "to hang". The obverse side displays the bagua. For a discussion of the bagua please see the Book of Changes and bagua charms. The reverse side of this old zodiac charm shows quite a bit of wear. The 12 Animals of the Chinese Zodiac surround the outside rim. The Earthly Branch associated with each animal is shown encircling the inner hole. For additional information on the 12 Animals of the Chinese Zodiac and the 12 Earthly Branches please visit old Chinese zodiac charms. This charm measures 67 mm in length and 49 mm in width at its "ears". This type of charm is rarely seen because of its unusual shape. The charm is in the shape of a vase or bottle. The vase symbolizes "peace" because the Chinese word for vase (ping 瓶) has the same pronunciation as the word for peace (ping an 平 安). It is difficult to see because of the wear but each side of the charm has a four character inscription written vertically. The inscription at the far left reads tian chang di jiu (天长地久) which means "as eternal and unchanging as the universe". The inscription at the near left is chang ming fu gui (长命富贵) which translates as "longevity, wealth and honor". This charm dates from the Qing (Ch'ing) Dynasty (1644-1911). The length is 77.8 mm, the width is 23 mm and the weight is 20.1 grams. 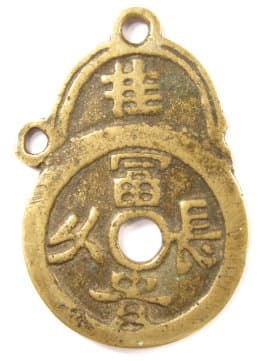 This is an interesting old Taoist (Daoist) charm, with a single loop at the top, that displays two of the "Eight Immortals". 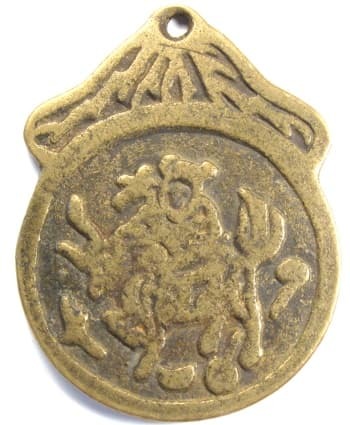 The obverse side is an amulet in that its purpose is to suppress evil spirits and avert misfortune. The Taoist Immortal is Lu Dongbin (Lu Tung-Pin 吕洞宾). In his left hand is his magic devil-slaying sword which can slay any ghost or demon. In his right hand is a whisk which allows him to walk on clouds or fly to heaven whenever he wishes. The inscription is read top to bottom as zhu shen hui bi (诸神回避) which translates as "evade all the spirits". At the very top of the charm, just below the hole, is a lotus. The Chinese word for "lotus" (lian 莲) is pronounced exactly the same as the word for "continuous" (lian 连) so the hidden or implied meaning is that the inscription on the charm should continue forever. The reverse side expresses the wish for good fortune and happiness. The Taoist Immortal is Zhong Kui (钟馗) with a sword in his right hand. He is famous as a fearsome slayer of evil demons. The projections from each side of his hat are "demon-seeking" devices that can point to unseen and lurking dangers. The inscription is read top to bottom as qu xie jiang fu (驱邪 降福) meaning "Expel evil and send down good fortune (happiness)". Just to the left of the sword at about the 11 o'clock position is a bat flying upside-down. Zhong Kui is usually depicted with a bat so this further confirms that he is the immortal on the charm. In Chinese, the word for "bat" (fu 蝠) and the word for "happiness" (fu 福) are pronounced exactly the same. If you say "upside-down bat" in Chinese (蝠倒), it sounds exactly the same as saying "happiness has arrived" (福到). Also, there is a lotus design just below the loop at the top. As mentioned above, the lotus symbol means that expelling evil and receiving good fortune and happiness should continue. For other examples of Chinese symbols with implied meanings please see hidden meaning of charm symbols. This charm's length is 53 mm and its maximum width is 38 mm. It weighs 23 grams. This is the obverse side of another Taoist (Daoist) charm with a loop meant for wearing. The inscription, read from top to bottom and right to left, is jiang fu bi xie (降 福避邪) which means "send down good fortune and keep away evil". There is also a yinyang (阴 阳), also known as taiji (太极), symbol at its center. The taiji was introduced in the Book of Changes (please see the I Ching and bagua charms) and in the Taoist classic Zhuang Zi (庄子). The reverse side has the bagua and also a taiji (太极) symbol at its center. The taiji is rotated 90 degrees from that on the obverse side. The charm is 54.6 mm in length and 41.3 mm in width. The weight is 24.2 grams.